April 28, 2017. We are happy to report that in March we purchased 1.3 acres of land adjacent to our main campus, which will be used for an athletic field and future expansion. The acquisition of an athletic field is the final requirement for our new high school to gain accreditation. With your support, as early as May we hope to make further improvements to this new land: we want to build a wall surrounding the entire acreage and a small building to use for storage, and install brand new playground equipment for the children. The existing campus has become cramped with three major building projects — the main building which has the boys home on the ground floor and the girls home on the second and third floors; the second building housing the elementary school on the ground floor and the dining hall on the second floor; and the third, newest building is the high school building which is ready to be occupied when the high school is opened. Thus, these building projects have left little space for the children to play. 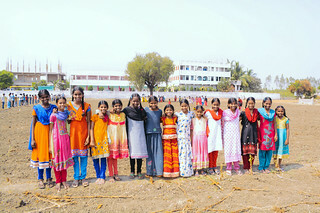 But now the children are extremely happy about the new land because it will give them the play space of their dreams.